The poems collected in What Nature were written in the predawn of the Sixth Extinction Event. They were written as sea levels rose over a tenth of an inch a year. They were written as albatross on the Midway Atoll fed their young with plastic bottle caps and cigarette lighters mistaken for brightly colored squid. They were written as insect excretions collected from Thai forests formed the shellac that gives jellybeans their sheen. They were not written on Walden Pond or in the Vale of Chamouni. They were not written because poetry can save the Earth. They were written because titanium dioxide is used to whiten ranch dressing and to protect the skin fium UV radiation intensified by the depletion of ozone in the stratosphere. They were written in the wake of Katrina, Sandy, Harvey, Irma, and Maria. They were written when Monsanto’s website offered “an additional $6 more per acre in cash when [farmers] apply Xtendilltax® herbicide with VaporGrip® Technology, now a restricted use pesticide, to their Roundup Ready 2 Xtend soybeans along with endorsed herbicides from Roundup Ready PLUS® Crop Man-agement Solutions.” They were written in the months leading up to New York City’s announcement that it is seeking billions in damages from BP, Chevron, ConocoPhillips, ExxonMobil, and Royal Dutch Shell for having “deliberately engaged in a campaign of deception and denial about global warming and its impacts.” They were written under Trump. 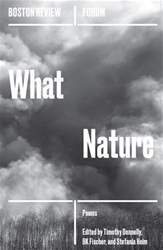 If they are a far cry from last century’s nature poetry, it is because what “nature” is today is a far cry from sanctuary or retreat or any supposedly tranquil, separate sphere where contemplation might unfold in ease. These poems are not at ease and there is no place left to retreat. They are themselves far cries: urgent coils for rethinking our place on an imperiled planet.